Designed for use with box rail. For use with #59, #5100, #5103, #5104, #5105, #5110, #5114 or #5116 box rail. Includes truck, connecting bolt and nuts. Packed without end caps. Made of durable one-piece, precision-formed steel. Comes with self-lubricating Delrin bearings. Safe working load - 225 lb. per hanger. 2.14" roller diameter. 4-1/2" bolt length, 4.49" overall length, 1.61" overall height. BHMA A138.18. Rigid with single door strap. Designed for use on wood-frame sliding doors from 1-1/2" to 2" thick. Slot in top of door strap allows lateral and vertical adjustment. 450 pound capacity per pair. Packed with two end caps and bolts for attaching door strap. Made of durable one-piece, precision-formed steel and has self-lubricating Delrin bearings. Boxed. Designed for use on wood-frame, metal-clad doors using a 2"x4" or 2"x6" frame with Stanley's 105270, 105676, 105213, and 105726 box rail. Includes two washers, four hex nuts, and two end caps per pair. Made of durable one-piece, precision-formed steel. Offers self-lubricating Delrin bearings. The 1/2" offset bolt adjusts both vertically and laterally from inside door. Connecting bolt threaded 7" adjusted laterally 1" by turning offset bolt for desired clearance. Can hold 450 lbs. per pair. 9" bolt. Boxed. Designed for use with round rail on wood-frame, metal-clad doors using a 2"x6" top lateral. 1/2? offset 9" bolt (with 7" thread) adjusts door vertically and laterally (1") from inside building. Flexible trunnion design resists door damage. Precision-ground and hardened steel roller bearings, axles and sleeves provide longer life and easier operation. Interchangeable with other brands of round rail. Safe Working Load - 300 lb. per hanger. Flexible with single door strap. Designed for use on wood-frame sliding doors from 1-1/2" to 2" thick. Slot in top of door strap allows lateral and vertical adjustment. 450 pound capacity per pair. Packed with two end caps and bolts for attaching door strap. Made of durable one-piece, precision-formed steel and has self-lubricating Delrin bearings. Boxed. Designed for use with box rail on wood-frame, metal-clad door using a 2"x4" or 2"x6" frame. For use with #59, #5100, #5103, #5104, #5105, #5110, #5114 or #5116 box rail. Packed with four washers, four hex nuts and two end caps per pair. 1/2" offset bolt adjusts both vertically and laterally from inside door. Connecting bolt threaded 7" adjusts laterally 1" by turning offset bolt for desired clearance. Durable one piece, precision formed steel. Each hardened axle has 12 hardened and precision-ground alloy steel roller-bearings. Delrin seals keep out dirt while holding in long-life grease. Safe Working Load - 300 lb. per hanger. 9" bolt. Designed for use with box rail on wood-frame or metal clad doors using a 2"x4" or 2"x6" frame. For use with #59 or #5110 box rail. 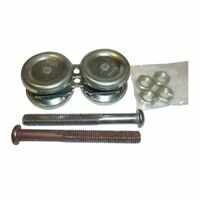 Packed with two washers, four hex nuts, and two end caps per pair; seventeen 3/8" x 2-1/2" lag bolts also are included for mounting rail. Durable one piece, precision formed steel. Comes with self-lubricating Delrin bearings. 1/2" offset bolt adjusts both vertically and laterally from inside door. Connecting bolt threaded 6" adjusts laterally 1" by turning offset bolt for desired clearance. Safe working load - 225 lb. per hanger. 9" bolt. Designed for use with box rail on wood-frame sliding doors from 1-1/2" to 2" thick. For use with #5114 and #5116 box rail. Packed with bolts for attaching door straps. Durable one piece, precision formed steel. Comes with self-lubricating Delrin bearings. Double door strap has opposing holes for bolt mounting. Safe Working Load - 225 lb. per hanger.